A kindly reader asked me today about a reference I'd made in a recent post to the Times Literary Supplement. "Do you really read it?" she asked. "Isn't it desperately heavy?" Not so, said I. The effortless fluency of Hugo Williams' fortnightly column is an exercise in lightness, albeit with a touch of melancholy. As for J.C's NB (of late apparently alternating with L.D), there is little of such understated excellence in contemporary journalism. My friend was insistent. "But still, it's not exactly an easy read, is it?" You are wrong, said I. The TLS is as easy as - let's see now - any of Sebald, Kafka, Conrad, Saramago, Joyce, Proust, Tabucchi, Hedayat, Vlad the Impaler of the Viennese Witch-Doctor, Marias and, for those moments when one feels the need to bask in a shower of unadulterated sexual madness, Bataille. "Your favourite writers?" uttered my inquisitor. "I didn't know you were into Bataille. How far does this obsession extend?" No further than the page, I replied, though I grant you that if one has in mind Roberto Bolano's articulation of the New Literature in Distant Star, even this could be problematic, but be that as it isn't, my interest in Bataille stops well short of ocular disenfranchisement. In any case, my point is clear: the TLS is for those of us who like our books. And aren't afraid to regard some as better than others. "Did you know," said my friend, "that the TLS has been running a series on its own appearances in literature?" Of course, said I: I'm a subscriber, how could I not know? "I assumed, given that you took some 10 back issues with you to Lanzarote, in the hope that you'd find time to read them, only to fail, only to return to this green and pleasant land with the same number languishing in your bag, as unread as they were before you left these shores, I assumed, given this, that you might have missed J.C's nice little series." I nearly did, but was cognisant of it nevertheless (said I). "Do you mean to say that you absorb the TLS by osmosis? That merely by dint of it being in your bag, you are capable of acquainting yourself with its contents?" Far from it. It's just that, in a rare moment of peace, I sat down with said back issues and read them. I happened upon J.C's series, and had the following thought. "That the surf blogs of the world should unite and chronicle mentions of the TLS?" Exactly. There's an audience, I'm sure. Only yesterday, as I surfed better than I had done for a long, long time and resolved that actually, I would not give up surfing (yet), I nevertheless perpetrated The Vile Sin of the Drop In on a gentleman surfing in just boardshorts. I don't think so. But when I said: "My good man, I'm terribly sorry, it's just that I've been out of action for rather long time and now, with a metal cage holding my neck together, I have moments of mental lacunae, and so, as I say, I'm sorry, I didn't mean to drop in and ruin your wave, but, if one were to analyse it, is what I did really so bad? Is it, for example, as bad egregious prose? Or a Jeffrey Archer piece of writing? Or even, dare I say, too cute a quatrain?" "Do you read the TLS?" he asked. "Can you mention it in your surf blog? If you do, all will be forgiven." And so, super-stoked after a damn fine surf and a nice chat in the line-up with a man who knows a good poem from a bad one (Sam Bleakley's dad, Fuz) I did. Look out for more mentions of the TLS in the surf blogs of the world. Or here, at least. Pictured by Jon Callahan, meanwhile, is Bleakers, finding a jazzy line on a rhythmic wave. Check out Sam's new book, Surfing Brilliant Corners, for a saner, and yet provocative, take on surfing than you'll find here. Life continues at its frenetic pace. Is this a good thing? I am not so sure. One of my gauges of happiness is how often I get to sit down with the Times Literary Supplement, which wends its way through my letter box every Thursday. The answer, of late, is never. I even took a load of TLSs with me to Lanzarote, to which Ryanair flew me in their own inimitable style last Wednesday. The purpose of my visit had been twofold: to interview Jose Saramago for The Times, and to pick up Josh Braddock, a hot young surfer and friend of my son Harry, who's staying with us for a taste of Cornish surf and in order to enter a comp or two. Regrettably, and to my great sadness, Saramago died about a month ago, though I did have the honour of penning his obituary for The Times (inaccessible sans subscription). I still had to get to Lanzarote, an island I adore, to pick up Josh (who, being under 16, can't fly to the UK alone). There he was, with his Dad Tila, at the airport on Wednesday, and before we knew it we were across the island at La Santa, which Josh knew was working as well as at any time in the summer. Also there was Dennis Smith, who lent me a board for my first post-neck-surgery waves when I was last on Lanzarote. Once again, Dennis volunteered his board, and once again, despite not for a moment thinking I'd be paddling out at La Santa, there I was, in the line-up. Not on the main right-hander, you understand - there is no point pushing things with my neck as it is - but on the middle reef, which was working well and, on the sets, at some size. I had a blast, catching more waves than I've had in the last nine months put together (not difficult, given how little I've been surfing), and surviving being caught inside at one point with the neck bearing up just about OK. Strange: each time I turn up in Lanzarote, there's Dennis, with a board. And Tila, Michelle, Heidi - all of them are great. Good things happen there. If only things had gone so well last night at a fog-bound Spot G. Harry and Josh having been knocked out of the British Junior Championships at Fistral (Josh in the quarters, Harry earlier - but he's not surfing enough to do well in comps at the mo...), they were itching for a surf on home territory, to which I returned (with Josh) on Friday. Spot G was invisible until we reached the beach, and even then, although it was clear there was surf, it was impossible to tell if anyone was riding it. We paddled out into the unknown to find a modest crowd (no more than about eight surfers) and some shifting but fast peaks in the head high range. Harry and Josh loved it but woe was me. I locked into a bad mental zone, one of no lifeguards, fog and something happening to my neck, and had a parlous surf. Where was Dennis and his magic board when I needed them? No at Spot G, in the fog and the gloom. Image of some serious Lanza surf courtesy of Centre Point Surf Lanzarote. Editing! What's it all about?! No one told me it'd be this busy. However, some more clean and sweet waves came my way last Sunday. Mellow, shoulder high on the sets, reasonable weather and tolerably crowded (as in, the crowd existed but was cool). I surfed my best waves in nine months and felt, without wishing to tempt fate, that I was at last back to normal. Well, sort of. What I know, via cervical myelopathy, as 'stupid left leg condition' returned post-surf, suggesting that perhaps I'm not quite there yet. Who knows? It was, though, great to surf well (by my humble standards) again. Meantime, here's a date for your diaries. It's 26-27 September, and it's the Budleigh Salterton literary festival. At which I am appearing. Oh yes. As a Son of Budleigh - I was brought up in the East Devon town - I reckon I ought to have been given headline status but then again this is the first lit fest to which I've been invited so I guess I'm just pleased to be rolling up. Martin Sorrell, a somewhat heavier hitter than yours truly, will be doing a Q&A with me the theme of which is 'A Colourful Life'. The photo, by local snapper, surfer and good man Russ Pierre, appears here. A couple of things I neglected to mention. First up, my brother Chris unexpectedly played a large part in my return to surfing. He was down here staying a couple of weeks ago and fancied a surf after the drive from Bristol. We paddled out at Sennen Cove, with the surf being about shoulder high and cleanish. I felt very uneasy for about an hour but eventually got a wave. Everything went well and, emboldened by this, Chris and I shared a party wave (in other words, I dropped in on him). Quite remarkable, really: in all these years, we'd never surfed together but there we were, riding the same pulse of oceanic energy. 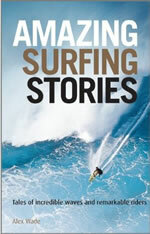 Secondly, for August's surf-themed issue of Cornwall Today I had the privilege of meeting Alasdair Lindsay. He's a Hayle-based artist with a fine collection of vintage surfboards - and a nice line in paintings tending towards abstraction which remind me a little of work by Wolfgang Bloch, albeit that their palette is brighter. Alasdair's Sunset Surfer is shown here.